Yellow to light red, files easily and does not spark when held to a grinder. Yellow Brass: It is typicaly plated, file through the plating to see the natural yellow color. 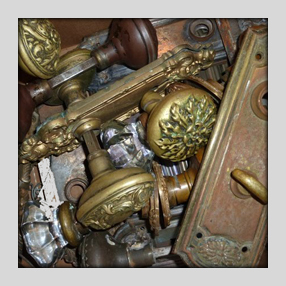 Brass will be found in ornamental itams, lamps, jewelry, plumbing, faucets, heater cores, planters, and urns. Red Brass: It is light red in color and files accordingly. Red brass is used more in industrial situations larger valves. Semi Red Brass: It is also light red in color. It is used in gears, meters, and flush valves. Aluminum Bronze: It is yellow and red in color. Although it is non-magnetic it may slightly draw to a magnet. Bronze can be found in plaques, gears, bearings, and urns.